[dropcap style=”flat”]W[/dropcap]hen it was announced that Swedish actress Alicia Vikander would star in a reboot of “Tomb Raider,” playing the chasm-leaping adventurer Lara Croft, many became skeptical of the film. The Lara Croft series, beginning with Angelina Jolie’s 2001 “Tomb Raider”, and the less entertaining sequel, “Tomb Raider: Cradle of Life” in 2003, seemed like a hollow but relentless action compilation. Despite the emptiness of Jolie’s Tomb Raider films, Vikander’s “Tomb Raider” reboot offers an exciting perspective of the failed series. Directed by the Norwegian specialist Roar Uthaug, “Tomb Raider” doesn’t tamp down Vikander’s inner flame or her talent. The movie is full of bow-and-arrow shooting and vine swinging action, most of which is expertly tailored to its star. In “Tomb Raider,” Vikander doesn’t come off as an action star the same way Jolie did. Rather, she comes off as an impulsive young woman who’s in over her head but will do whatever it takes to beat the odds. Vikander’s portrayal of Lara Croft is one of the most grounded and believable cinematic video-game protagonists, based on the rebooted origin-story version of the original game, and since Vikander acts more like a human than a video game character, the movie is much more riveting. Vikander’s humanization of Lara Croft may not make “Tomb Raider” anything more than an imaginative adventure, but it also creates the desired blockbuster with a bit of heart. A handful of the movie’s set pieces are lifted right out of the game, yet “Tomb Raider” isn’t beholden to sequences directly taken from the series video games. 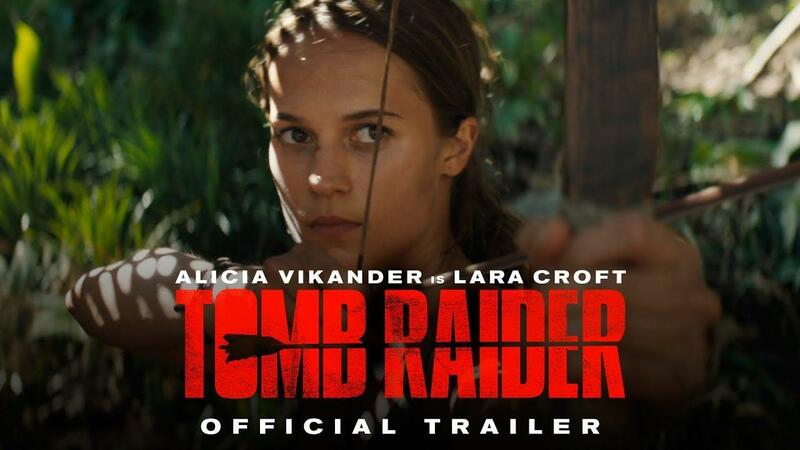 “Tomb Raider” remains very much its own thing, starting with a “fox hunt,” Vikander has to escape a mass of bike-riding “hunters,” and does it with the kind of split-second ingenuity that will serve her well when she lands on Yamatai, a rocky fairy-tale island off the Japanese coast, where her father disappeared seven years previous. Lara, an heiress who chooses not to act like one, is disconnected from her family’s vast holdings, not having access to her wealth. It’s her relationship with her vanished father, the tender, protective Richard Croft (Dominic West), that creates the film’s unexpected emotional core. We meet Richard in flashbacks, where he stands in the garden of Croft Manor, saying goodbye to the young Lara as he heads off on another open-ended business trip. In outline this all seems quite standard, but now that it’s time, after seven years, to legally declare Richard deceased, Lara discovers that he has left her a trail of breadcrumbs. The first raised letter on his crypt leads to his secret study, where she learns where he traveled to before his disappearance, to Hong Kong and then to Yamatai, all in search of Himiko, an ancient sorceress who was buried alive. What powers the movie and elevates it, is the way Vikander displays Lara’s yearning to discover the fate of her father. She has to know, and this desire powers every scene. Much of the effectiveness of “Tomb Raider” comes down to a fresh but old-fashioned idea, being Uthaug’s decision to shoot a movie that pivots around omens, curses and amulets, but as a somewhat realistic thriller that might actually be taking place, rather than delivering the outlandish. “Tomb Raider” lures us into suspending our disbelief, which some may find a touch drab, but the film’s intense likability is that it’s a reverie of feminine power and action that audiences craves. That spirit extends from Vikander to the performance of Walton Goggins, who plays Mathias Vogel, the dastardly hunter who’s been stranded on Yamatai for seven years, searching for Himiko’s tomb. Vogel treats his army of workers like property, and Goggins, a magnetic actor who projects the hungry anger of vintage-period Jack Nicholson, never hits you over the head with evil. Instead, he lets Vogel’s cruelty seep through his pores. In the end, though, it’s Vikander’s movie. Done right, there’s a special tingle to the image of someone who’s not an action heroine becoming an action heroine. When Lara stands in Himiko’s temple of doom, trying to figure out what to do as spikes jut out of nowhere or a booby-trapped floor falls away, piece by piece, she’s standing in for all of us. “Tomb Raider” is brisk but derivative, an essence of jungle-chases spun into something stylishly watchable. Yet when a movie like this one is made with a pretense of the human touch, and when it gives an actress as alive as Vikander a chance to form a true character instead of just inhabiting a series of stronger-than-life poses, you walk out feeling honestly entertained rather than restless with overkill. Ultimately, “Tomb Raider” is an entertaining action-packed adventure, and with Vikander as the star, it is sure to appeal to all audiences. Jacob Sykuta is a junior at Rock Bridge and a writer for The Rock and Bearing news. In his free time he enjoys running for the Rock Bridge Track and Field and Cross Country teams, being with friends, family and his golden retriever, Ella.